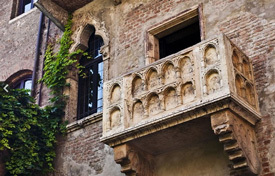 Tourists who leave sentimental notes in the courtyard beneath the balcony where Juliet is said to have been wooed by Romeo are facing a fine of up to 500 euros ($648.20) as Verona clamps down on the tradition. The result is an unsightly mess of hardened blobs of gum and tattered scraps of paper which deface the World Heritage-listed city’s most popular attraction, a former inn known as the Casa di Giulietta or Juliet’s House. A new decree being drawn up by Verona city council will prohibit the sticking of chewing gum or adhesive Post-it notes to the walls and the consumption of food or drink in the courtyard of the house. Writing love-struck graffiti on the walls of the courtyard and the tunnel that leads into it will also be banned, apart from on specially-provided, removable panels. Anyone caught breaking the new rules, which will be enforced by local police, will risk a fine of up to 500 euros. Sticking bits of chewing gum and sticky notes on the walls was “hardly in keeping” with such a celebrated place, said Flavio Tosi, the mayor of Verona. “We’ve decided to enact a law that will sanction anyone who indulges in this kind of behaviour. “A sign will be put up telling tourists where they are allowed to post their messages – that is, on the removable panels that we have provided.” The council enacted a similar decree in 2004 and succeeded in cleaning up the area for a while, but the gum stickers returned. Verona earns a fortune from the legend of Romeo and Juliet, despite the fact that there is little evidence that the couple ever existed. Historians say there is almost nothing to link the house to Shakespeare’s tragic love story and that the celebrated balcony was constructed out of bits of a medieval sarcophagus in the 17th century. Each year sack loads of letters addressed simply to “Juliet’s House, Verona” arrive from around the world. Replies are written by a team of local volunteers from the Juliet Club, who occupy an upstairs office near the courtyard. 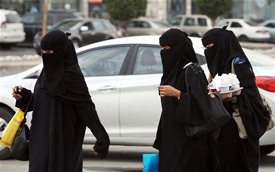 Women in Saudi Arabia are now monitored by the government using an electronic system that tracks any cross-border movements, alerting their male guardians by text if they attempt to leave the country. As of last week, Saudi womens’ male guardians began receiving text messages on their phones informing them when women under their custody leave the country, even if they are traveling together. “The authorities are using technology to monitor women,” said Saudi author and journalist Badriya al-Bishr, who criticised the “state of slavery under which women are held” in the kingdom. “This is technology used to serve backwardness in order to keep women imprisoned,” she added. In June 2011, female activists launched a campaign to defy a driving ban, with many arrested and forced to sign a pledge they will never drive again. Last year, King Abdullah granted women [for the first time ever] the right to vote and run in the 2015 municipal elections, a historic first for the country. The myriad restrictions on women have led to high rates of female unemployment, estimated at around 30 per cent. In October, a justice ministry directive to allow female lawyers who have a law degree and who have spent at least three years working in a lawyer’s office to plead cases in court was published. But the ruling, which was to take effect this month, has yet to be implemented. GREAT BRITAIN – Could chicken feet to China be Britain’s next big export? …Chicken feet discarded by British factories could soon be winging their way to supermarket shelves in China. During trade talks in China earlier this month, Britain’s Environment Secretary, Owen Paterson, signaled his intention for British poultry producers to export chicken feet to the country, where they are a highly sought-after delicacy, served hot in soup or cold as a handy bar snack. On a visit to a Tesco supermarket in the centre of Shanghai on the second day of his trade mission, Mr Paterson showed a surprise interest in feng zhao, or “phoenix claws” as they are known in China. More than 850 million chickens are processed in British factories every year. Most of their 1.7 billion feet are rendered into pet food, along with other unwanted body parts such as heads, livers and gizzards. But now there are hopes that Mr. Paterson’s intervention could lead to the poultry industry winning a coveted licence to trade with China, whose poultry consumers are less fussy than Europeans. The UK already exports chicken feet to other Asian markets including Thailand and Hong Kong, and recently struck an $80 million deal to export pig body parts to China, where the tail, ears, brain and trotters of a pig are all eaten. Any trade deal on poultry could be even more profitable. 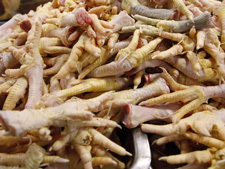 In 2008, the US exported $677 million of chicken to China with chicken feet making up about half the value. China imported $57.6 billion worth of food last year. British trade with the world’s second-largest economy could be worth $160 billion by 2015, Mr Paterson said. About 30 million chicken feet are removed from carcasses in British factories every week. “The feet are removed fairly early in the process,” said Robert Smith, from the meat processing company Vion. The British Department of Environment, Food and Rural Affairs was unable to confirm whether or not the Secretary of State had tasted chicken feet during his visit to China. b) The city of Verona brings in a lot of revenue from tourists who visit the supposed house/balcony of Juliet. Do you think the new decree the city council plans to pass is a good idea? Explain your answer. b) The Saudi government (and many/all? Saudi men) defend the practice of requiring every woman to have a male guardian by saying this protects the women. How would you respond to this logic? b) How much chicken does the U.S. export to China yearly? Approximately how much of that is chicken feet? Under Saudi Arabia’s strict Islamic laws, women require a male relative’s permission to travel abroad. In recent years, much has been made of the fact that Saudi Arabia is the sole remaining country in which women still have not been given the right to drive. But restrictions experienced by Saudi females extend to far more than just getting behind the wheel. A woman is not allowed to go to school, get a job, or even travel outside the country without first obtaining the permission of her male “guardian,” or mahram. In Saudi Arabia, every woman has a male guardian — traditionally her father, husband or brother. Saudi Arabia is the only country in the world that bans women – both Saudi and foreign – from driving. The prohibition forces families to hire live-in drivers, and those who cannot afford the $300 to $400 a month for a driver must rely on male relatives to drive them to work, school, shopping or the doctor. Saudi clerics, from the hard-line Wahhabi school of Islam that is the official doctrine of the kingdom, insist the ban protects against the spread of vice and temptation because women drivers would be free to leave home alone and interact with male strangers. King Abdullah has promised reforms in the past and has taken some tentative steps to ease restrictions on women. But the Saudi monarchy relies on Wahhabi clerics to give religious legitimacy to its rule and is deeply reluctant to defy their entrenched power. There is no written Saudi law banning women from driving, only fatwas, or religious edicts, by senior clerics that are enforced by police. No major Islamic clerics outside the country call for such a ban. More than two decades ago, a group of women got into cars and drove the streets of Riyadh. The protest cost the 47 female drivers and passengers dearly. They were arrested, lost their jobs for 2 1/2 years, were banned from travel for a year and were condemned by the powerful clergy as harlots. In May 2011, another woman was also reportedly arrested, along with two female relatives, after driving to a grocery store in a remote area of al-Ras province north of Riyadh, according to the website of the Al-Riyadh daily. The paper quoted the woman as saying she doesn’t have a male relative to take her shopping and has driven herself to the supermarket in the past.